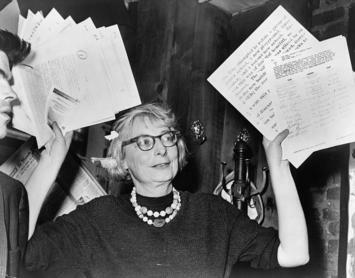 Few people have had more influence on thinking about cities than the late Jane Jacobs. The onetime New Yorker turned Torontonian, Jacobs, who died in 2006, has become something of a patron saint for American urbanists, and the moral and economic case she made for urban revival has been cited by everyone frompundits and think tanks to developers. However, though widely celebrated for her insights and unabashed embrace of dense urbanism, Jacobs may ultimately prove more influential than relevant. Her writing was often incisive and inspiring, particularly when she opposed planning and overdevelopment and embraced the role of middle-class families in cities. But the urban revival that has actually taken place is at variance with her own romantic version of cities and how they work. Currently the American cities that are doing best are not those with a flourishing middle class but those have become the preferred playgrounds of the rich and famous—New York, San Francisco, even Washington, D.C. At the same time, vast portions of urban America remain cut off from society’s mainstream. When Jacobs published her most important work, The Death and Life of Great American Cities,in 1961, America’s cities were clearly in trouble. Racial tensions and a massive flight to suburbia were undermining the promise of cities, and the only response of planners at the time seemed to be to expand freeway access, tear down old neighborhoods, construct massive apartment blocks, and subsidize big employers. Yet when cities did begin to come back—a handful in the ’80s and then again more around the time of the millennium—the revivals were in many ways the opposite of her grassroots vision. Instead of creating more family-oriented middle-class neighborhoods, the urban revival ended up being based on “luring” the affluent, the still forming young person, or the accomplished, childless professional than generating a new middle class. As Rybczynski suggests, the current rise of “urban vitality” derives not from the idiosyncratic, diverse and, if you will, democratic form that Jacobs celebrated but in a more manufactured matter that at times outdoes suburbs for conformity and boredom. Jacobs’s vision failed in large part because today’s cities play a different economic role than they did in the past. The economic basis of her New York—small businesses, manufacturers, business service firms employing masses of middle-class workers—has declined while the city has evolved into what Jean Gottman called the “transactional metropolis,” dependent on the most elite financial services, high-end consumption, and the all too present media industry. This urban economy has many strengths but increasingly relies on the rich. A Citigroup study suggested that cities, particularly New York and London, have become “plutonomies”—economies driven largely by the wealthy class’s investment and spending. In this way the playground or luxury cores serve less as places of aspiration than geographies of inequality. New York, for example, is by some measurements the most unequal of American major cities: Gotham’s 1 percent earns a third of the entire city’s personal income—almost twice the proportion for the rest of the country. Other luxury cores exhibit similar patterns. A 2014 recent Brookings report found that virtually all the most unequal large central cities—with the exception of Atlanta and Miami—are dense, luxury-oriented cities such as San Francisco, Boston, Washington, New York, Chicago, and Los Angeles. Although high-wage jobs have increased in these metropolises, the bulk of new employment in cities like New York has been in low-wage service jobs. Even diversity, often cited by Jacobs as a great asset of cities, has suffered. Among the most successful cities today are what analyst Aaron Renn has labeled “the white cities”—places like Boston, San Francisco, Seattle, and Portland, Oregon—which have historically been home to relatively small and now shrinking, minority populations. San Francisco’s black population is 35 percent lower than what it was in 1970. In the nation’s whitest major city, Portland, African-Americans are being driven out of the urban core by gentrification, partly supported by city funding. Similar phenomena can be seen inSeattle and Boston, where long existing black communities are rapidly shrinking. In the more diverse big cities like Los Angeles, New York, and Chicago, gentrification takes place alongside growing concentrations of poverty. It is often forgotten, according to demographer Wendell Cox, that 80 percent of the increase in urban core population in the last decade was from poor people; overall, despite the growth of poverty in suburbs, the core poverty rate remains more than twice as high. We see this in places like Brooklyn and Chicago, two much-hyped epicenters of urban gentrification. Brooklyn’s poorer sections—a quarter of the residents are onfood stamps—have become even more so, notes analyst Daniel Hertz. Incomes between 1999 and 2001, he notes, dropped overall, falling in the poorer areas even as they soared in the more gentrified neighborhood closer to Manhattan and surrounding Prospect Park. Jacobs never got this point, perhaps because she instinctively hated where families were in fact headed: the suburbs. Like many intellectuals in the ’50s and ’60s, she saw no need for suburbs, even as they experienced explosive growth, just dense city surrounded by traditional countryside. Certainly statistics back up Preville’s assertion. Greenwich Village today now largely consists of students, wealthy people, and pensioners. Despite the presence of many young people, children and teens between 5 and 17 account for only 6 percent of the Village’s population, far below the norms for New York City (PDF), and less than half the 13.1 percent found across the United States’s 52 largest metropolitan areas. Overall, Manhattan has among the lowest percentage of children in the country; a majority of its households are made up of singles. This pattern holds across the country. According to census data, in 2011 children 5-14 constitute about 7 percent in core districts across the country, roughly halfthe level seen in suburbs and exurbs. By 2011 people in their 20s constitute roughly one-quarter of the residents in urban cores, but only 14 percent or fewer of those who live in suburbs, where the bulk of people go as they start to reach the point of establishing families. Overall, high-density cores, whether in Canada, America, or East Asia, consistently exhibit the lowest percentages of children. The far more ultra-dense cities of East Asia—Hong Kong, Singapore, and Seoul—exhibit the lowest fertility rates on the planet (PDF), sometimes less than half the number required simply to replace the current population. Due largely to crowding and high housing prices, 45 percent of couples in Hong Kong say they have given up on having children. In Asia people have few opportunities to move to lower-density housing. But in the United States, with abundant and often much cheaper land, super-urbanity often serves as a kind of way station in which people spend only a portion—often an exciting and career-enhancing one—of their lives. But when they grow older, and particularly when they decide to start families, they tend to leave for the periphery. Wishing to return to something that last predominated a half-century ago does not mean it will occur. Just as conservatives who hearken for a return to the ’50s are sure to be disappointed, urban advocates who suggest a “return to the city” for middle-class families will be as well. Both minorities and millennials, often thought of as spearheading a “back to the city” drive, are, according to most indicators, moving out to the suburbs as they enter their 30s and start families. Dense urbanity, of course, remains a huge contributor to the nation’s economy and culture. Urban centers are great places for the talented, the young, and childless affluent adults. But for most Americans, the central city offers at best a temporary lifestyle. It does not fit with what people can afford and where they want to live. There is a reason why 70 to 80 percent of Americans in our metropolitan areas live in suburbs, and those numbers are not likely to change appreciably in the coming decade. Cities, as Jacobs hoped, have indeed experienced a renaissance, but not in the form she preferred. To be sure, this revival is a hell of lot better than the urban dystopia that developed in the years after Jacobs’s Death and Life of Great American Cities first appeared. But it’s time to recognize that we are not seeing a renaissance of the kind of middle-class urbanity that she loved and championed. That city has passed into myth, and, unless society changes in very radical ways, it is never going to come back. Submitted by davebarnes on Tue, 08/04/2015 - 09:46. When I first read Jane's book in 1968, one of the major takeaways for me was: Robert Moses was a destructive whirlwind. I still hew to that conclusion. Submitted by lukelea on Sun, 08/02/2015 - 21:52.